Like many of us, I love sport. I care deeply about athlete performance. It is my job to. That passion has enabled me to wear a number of hats in the arena. I’ve been an athlete (triathlon and cycling), a coach, a professor, and an applied sport scientist. Residing in this sometimes messy, often fun, middle-space, between research, theory and application, which do not always align, I’ve been able to make some observations, identify some problems, and foster some solutions. In our first blog post, I wanted to provide the story about how this innovation was formed to bridge a small gap between science and practice, by mixing scientific understanding and ingenuity to alter athlete temperature. In 2015, I delivered a presentation in Paris on this topic, entitled: Keeping your cool: How fluid temperature affects thermal comfort and performance in the heat. Figure 1. 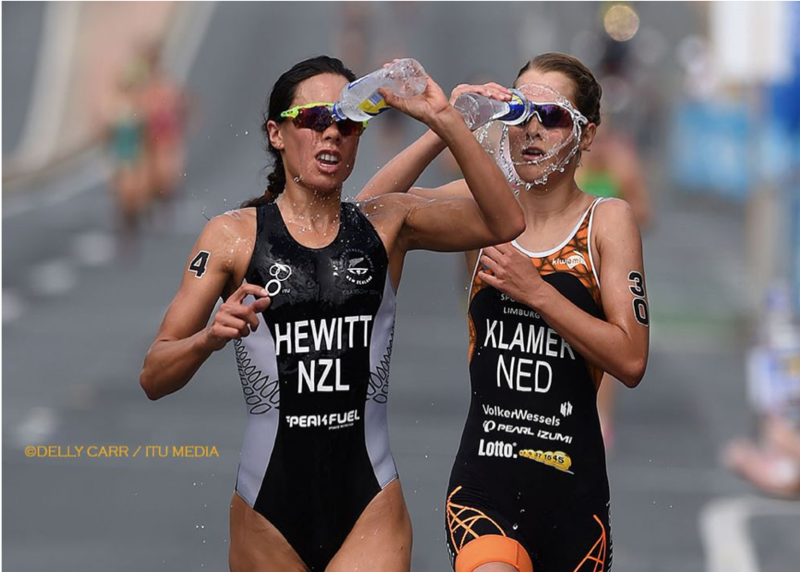 Elite triathlete’s Andrea Hewitt (left) and Rachel Klamer (right) competing in the International Triathlon Union World Triathlon Series event on the Gold Coast of Australia (April 2015) in hot conditions (28C, 70% humidity). Photo Credit (with permission granted): International Triathlon Union/Delly Carr. My opening slide included the picture, shown as Figure 1. Here we have two elite triathletes, Andrea Hewitt and Rachel Klamer, racing in the Gold Coast World Series Race in Australia (April 2015). In this race, it was 28Celsius, with high humidity. To me, this picture speaks volumes about what’s really important when maximizing performance in hot environments. Consider the following question: what’s essential to these athletes when they have cold fluid in their hands? Are they thirsty and dehydrated, or is it more likely that their brain/body is overheating? If these athletes were thirsty, and fluid consumption mattered to their brain/mind at that point, then surely they would be more interested in drinking that fluid; but clearly they are not. When it’s on, with metabolic heat production sky high, like it is in most of the Olympic sports we deal with, its brain temperature, or perhaps more the brain’s interpretation of a body that’s too hot, or becoming too hot, that matters 1. So let’s go back in time a bit and allow me to tell you the story about how I became involved in discovering the importance of fluid temperature for performance in the heat. While employed as a lecturer at Edith Cowen University (ECU) in Perth Australia, I enjoyed collaborating with Dr David Martin, an Australian Institute of Sport Senior Physiologist, in the area of precooling athletes before competition in the heat in order to improve performance. It was 2006, and the Beijing Olympics were at the forefront of our minds. We’d put our heads together previously for the Athens’ Games strategy where we had arrived at the position that the best precooling strategy possible, was a combining a plunge pool maneuver with an ice jacket to retain body coolness.2 Beijing, expected to be just as hot, was up next, and we were still searching for something effective and practical to keep athletes cool. Meanwhile, a sport scientist up in Darwin, named Matt Brearly, was doing some experimentation during his bike rides. Of course, it doesn’t get much hotter in Australia than this place. Very simply, he was looking at what happened to his performance times riding home from work when he drank cold fluids vs. ice slushy. Ice slushy is the mix of solid ice particles and a bit of glucose to serve as an antifreeze, inside a water medium to form a slurry. Matt was finding a big difference to his performance times in the heat, going much faster when he drank the ice slushy before his ride. Now why would that be? It was 2006, and Beijing Olympics were forefront of mind. We’d put our heads together previously for the Athens’ Games strategy where we had arrived at the position that the best precooling strategy possible, combining a plunge pool maneuver with an ice jacket to retain body coolness 2. Beijing, expected to be just as hot, was up next, and we were still searching for something effective and practical to keep athletes cool. Meanwhile, a sport scientist up in Darwin named Matt Brearly, was doing some experimentation during his bike rides. Of course it doesn’t get much hotter in Australia than this place. Very simply, he was looking at what happened to his performance times riding home from work when he drank cold fluids vs. ice slushy. Ice slushy of course is the mix of solid ice particles, a bit of glucose to serve as an antifreeze, inside a water medium to form a slurry. And Matt was finding a big difference to his performance times in the heat, going much faster when he drank the ice slushy before his ride. Now why would that be? To understand, we need to dig deeper. With phase change, any energy required to reconfigure a substance from a solid to a liquid water gets transferred from the area of concern. In a person ingesting the ice slushy, that’s the person themself. So in theory, even if the substances were at the same temperature (0°C), the solid ice component of ice slushy would make you cooler than the liquid water due to that phase change energy component 1. Great in theory, but it needed to be tested. Would it really work? To begin, we did a very simple study; similar to what Matt did in Darwin. What happened to run time to exhaustion in the heat if we ingested cold water or ice slushy beforehand? 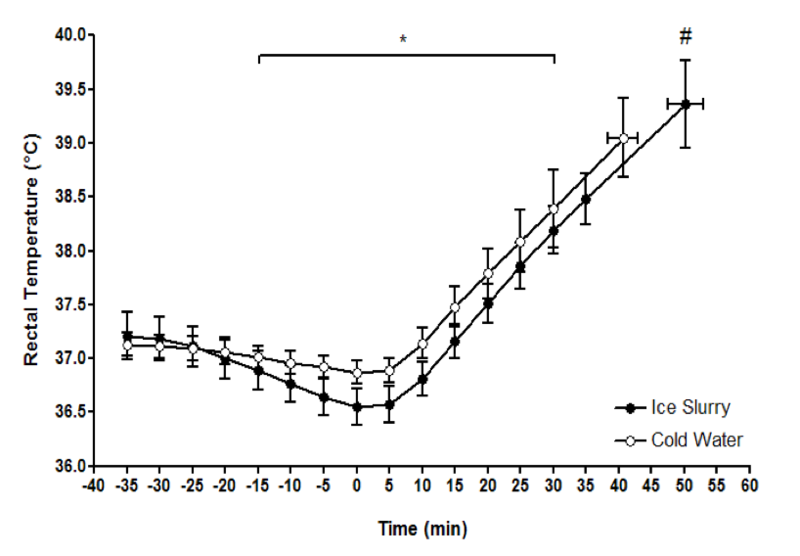 Here, doctoral student at the time, Rod Siegel, showed us that the ingestion of ~500g of ice slushy in the 30 min period prior allowed subjects to run an average of 10 min longer (20%) compared with drinking a 4°C solution of the same volume (Figure 2; 3). Simple now, but I remember being fascinated at the time, as I experienced the effect myself as one of the subjects. You didn’t feel as hot, and exercise felt easier. The second most interesting finding for me was the consistent elevation of core (rectal) temperature above the control condition. The data was flying in the face of the critical core temperature hypothesis; that is, we all have this set point of temperature that you can reach, but it doesn’t go any higher. So why was ice slushy ingestion allowing rectal temperature to get higher? Simply due to the proximity of where it was being measured – rectally – suggesting to us that its more likely that brain temperature, or the brain’s interpretation of body temperature, that is important when performance matters in the heat. Meanwhile, another group replicated our finding in field conditions in the Singapore heat 4. Fast forward to 2010. Working for the sport of Triathlon at High Performance Sport New Zealand, I pondered the concept that perhaps precooling with ice slushy might improve run performance in hot conditions. Before I even had the chance to test this myself, Chris Stevens, a triathlete and sport scientist from Australia, proved the concept and showed improved run times in the heat following ice slushy ingestion during the cycle phase of a simulated Olympic distance triathlon 5. Problem was, while Stevens et al. 5 nicely proved the concept in the lab, application in the field wasn’t as easy. Existing bottles did not contain spouts that allowed the flow of ice slushy to the user. A solution was needed, and was achieved through a 4th year engineering student program out of the University of Canterbury in Christchurch, NZ. Here, a group of engineering students took on the problem and came up with a solution (Figure 3). Once the concept was proven, we tested the bottles with a group of elite triathletes. While they enjoy the ice slushy on hot days, the reality was that the bottle was cumbersome and leaked. A commercial solution was clearly needed, and was achieved by transferring the intellectual property out of High Performance Sport New Zealand into a New Zealand corporation (Teknicool Limited), who created a product for sale (Figure 4). High performance athletes and teams around the world now use the invention. The journey from scientific understanding to application has not been without challenges, but the learning has been rich. As scientists continue to search for ways upon which athletes can keep their cool, watch for more refinements and innovation in this space. 1. Siegel R, Laursen PB. Keeping Your Cool: Possible Mechanisms for Enhanced Exercise Performance in the Heat with Internal Cooling Methods. Sports Medicine 2011. 2. Quod MJ, Martin DT, Laursen PB, Gardner AS, Halson SL, Marino FE, Tate MP, Mainwaring DE, Gore CJ, Hahn AG. Practical precooling: effect on cycling time trial performance in warm conditions. J Sports Sci 2008; 26:1477-87. 3. Siegel R, Mate J, Brearley MB, Watson G, Nosaka K, Laursen PB. Ice slurry ingestion increases core temperature capacity and running time in the heat. Medicine and Science in Sports and Exercise 2010; 42:717-25. 4. Yeo ZW, Fan PW, Nio AQ, Byrne C, Lee JK. 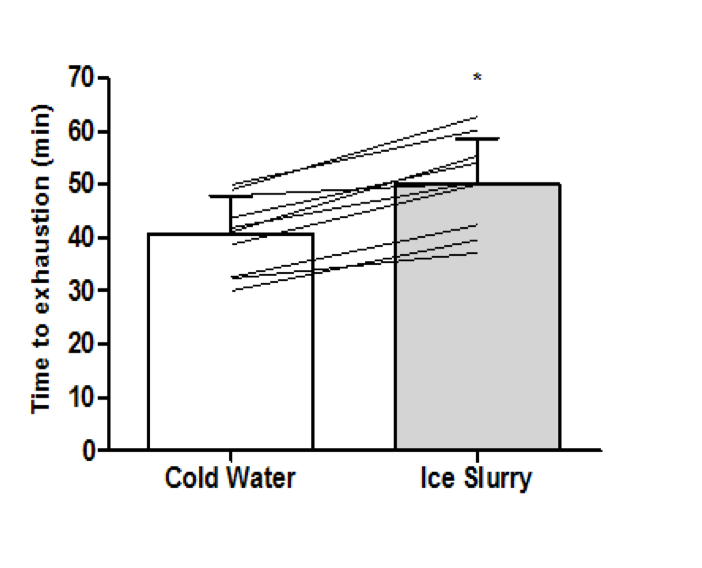 Ice slurry on outdoor running performance in heat. Int J Sports Med 2012; 33:859-66. 5. Stevens CJ, Dascombe B, Boyko A, Sculley D, Callister R. Ice slurry ingestion during cycling improves Olympic distance triathlon performance in the heat. J Sports Sci 2013; 31:1271-9.